1Department of Biochemistry, Manonmaniam Sundaranar University, Abishekapatti, Tirunelveli-627 012, Tamilnadu, INDIA. 2Department of Animal Science, Bharathidasan University, Trichy, Tamilnadu, INDIA. 3Department of Biotechnology, Bharathiar University, Coimbatore- 641 046, Tamilnadu, INDIA. 4Assistant Professor, Department of Biochemistry, Sri Meenakshi Vidiyal College of Arts and Science, Trichy, Tamilnadu, INDIA. 5Department of Biochemistry, MIET Arts and Science College, Trichy, Tamilnadu, INDIA. 6Department of Human Genetics and Molecular Biology, Bharathiar University, Coimbatore-641 046, Tamilnadu, INDIA. Background: Oxidative stress plays an important role in chronic complications of diabetes, cancer, liver disorder etc. The free radicals such as superoxide anions, hydrogen peroxides are causing the oxidative stress and it involves the cellular damage. Evidences recommended that the natural medicines from plant sources are treated to overcome the oxidative stress complications. 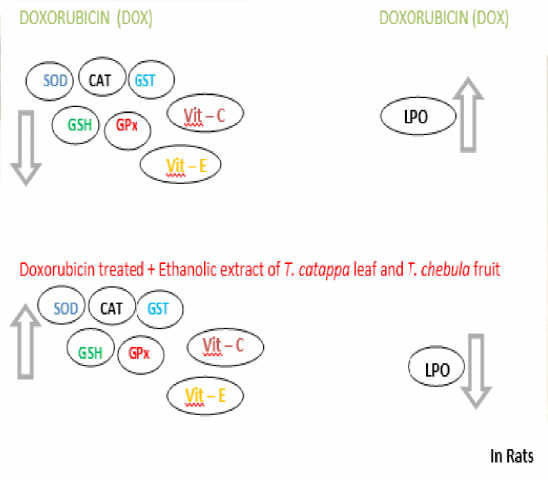 Objective: The aim of the present is to find the antioxidant activity of the ethanolic extract of Terminalia catappa leaves and Terminalia chebula fruits in the doxorubicin (DOX) induced toxicity rats. Methods: Oxidative stress is induced with a single dose of doxorubicin and then the animals were treated with a dose of various concentration of ethanolic extract of T. catappa leaves and T. chebula fruits (200, 300 mg/kg/b.w) for 21 days. After the treatment, lipid peroxide (LPO), reduced glutathione (GSH), vitamin C, vitamin E, glutathiones- transferase (GST), glutathione peroxidase (GPx), superoxide dismutase (SOD), catalase levels are determined. Propranolol 25mg/kg is used as standard drug. Results: In the present study, after the treatment of doxorubicin the levels of SOD, CAT, GSH, GST, GPX, vitamin C, vitamin E levels are decreased and LPO level is increased. After the treatment of T. catappa leaves and T. chebula fruits the levels were returned to the normal level. Conclusion: The results proved that the ethanolic extract of T. catappa leaves and T. chebula fruits may protects the cells from oxidative stress induced by the doxorubicin induced toxicity rats. Keywords:Doxorubicin, Enzymatic antioxidant, Non-enzymatic antioxidant, Oxidative stress, Termianlia catappa, Terminalia chebulla. Punniyakotti P, Rengarajan RL, Velayuthaprabhu S, Vijayakumar K, Manikandan R, Anand AV. Protective Effect of Terminalia catappa Leaves and Terminalia chebula Fruits on the Enzymatic and Non-enzymatic Anti-oxidant Levels in the Doxorubicin Induced Toxicity Rats. Pharmacognosy Journal. 2019;11(2):346-349.